During the last two days, I’ve had the opportunity to attend the Global Leadership Summit. The actual Summit is taking place in Chicago, but my home church, Central Baptist Church of Sioux Falls, has the opportunity to serve as a satellite location. This year, we’ve had more than 420 leaders come to the Summit from businesses, non-profits and churches from around the region. One of the goals of the Leadership Summit is to equip individuals with resources to help lead better. The Summit is only two days a year, but leaders can take home resources that will equip them throughout the year. Often, this comes by way of reading books, but the Association puts on a number of other events and produces a number of other resources throughout the year. 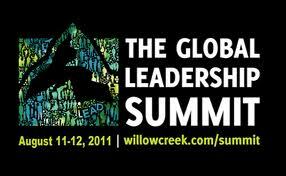 I didn’t have the opportunity to attend the Leadership Summit in 2010, but was still able to get a lot of value out of the resources, which were highlighted by the Summit. Last year, I read Jim Collins’ “How the Mighty Fall”, after it was featured in the Leadership Summit. This year, I was exposed to a number of great books that I plan on reading between now and next August. Axiom and Holy Discontent by Bill Hybels– Bill Hybels is the senior pastor of Willow Creek Community Church in Chicago and is behind the Willow Creek Association, which puts on the Leadership Summit each year. I read two of his recent books, Axiom and Holy Discontent. Axiom is a series of short stories, which highlight a principle about leadership. I wrote about Axiom extensively in a post titled, The Wisdom of the Ages. I also wrote about Holy Discontent in a post titled, Can Anger Work for God?. The Principle of the Path and It Came From Within by Andy Stanley – Andy Stanley is the senior pastor of Northpoint Community Church, a large multi-site congregation based out of Atlanta. I had the opportunity to read two of his books this summer, including It Came From Within and The Principles of the Path. I wrote extensively about The Princple of the Path in a post titled, “What Path Are You Heading down?”. It Came From Within is a short book about dealing with one’s emotional core. The book helps readers understand where anger, jealousy and other negative emotions come from and how to deal with them. Boundaries by Dr. Henry Cloud– Boundaries is a great book about dealing with difficult people. It’s a must-read for anyone that has coworkers or family members that are difficult to deal with. Linchpin by Seth Godin – Seth Godin has written a number of books, with Linchpin being one of the most recent. Godin discusses how you can make yourself an indispensible leader in any organizational. Action Trumps Everything by Leonard Schlesinger – This is a book targeted toward entrepreneurs about how to deal with a changing world. The book ‘s message is that it’s okay to not know what the future looks like, that we should be biased toward action, and that we should continually evaluate what we’re doing. I believe this book will be particularly helpful in my business, which seems to change dramatically on a monthly basis. Poke the Box by Seth Godin – The nice thing about Seth Godin’s books is that they are very high density. There’s lots of great content, and they aren’t very long. Poke the Box is a call to action. He tells readers that they don’t need permission or more time to start and lead the project they’ve always wanted to do. Too Busy Not to Pray by Bill Hybels – This book is a challenge to leaders that the need to pray is still very real. God is still God and he still wants to change us through prayer. Prayer is something that I’ve long struggled with as a leader. My natural inclination is that lots of action and hard work can fix any problem, but really, God is the answer to fix any problem. This book will be a nice reminder about what’s really important. Onward by Howard Schultz – For some reason, Howard Schultz cancelled his presentation less than 24 hours before the Summit was scheduled to begin. I still want to read his book, however. Onward is the story of how Starbucks re-imagined its business during the Great Recession. Schultz also shares his leadership philosophy in the book. You can also purchase a “Team Edition” of the material from the Leadership Summit. It contains DVDs of every video as well as a number of additional resources presented at the summit.